Another adapted post. Sage advice for gentlemen on choosing shoes. 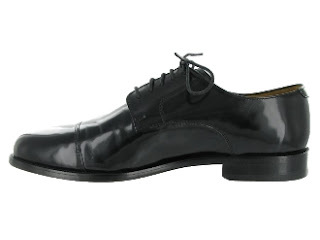 Yes, every man should have at least one good pair of BLACK dress shoes. These are from Cole Haan — the Cassady Captoe II, to be specific. Leather. Black. Lace up. Men’s dress shoes have LACES. Loafers or “slip-on” shoes do NOT go with your well-chosen, tailored suit. Ever. Grey trousers, blue sport coat, tie and possibly slip-on leather shoes. But NOT with a suit. If you are escorting your girlfriend to a wedding, you NEED a pair of shoes like these. This particular pair will run you between $100 and $140 depending on where you buy. That’s a great deal. I tried a pair on last night and they are comfortable, classy, and will make any suit look great. Cole Haan is a solid brand and they make quality products. So, ditch the square-toed loafers you wore with a suit in college — get these! Wear them with a suit to a wedding, a job interview, or anywhere else that calls for dress clothes. And remember to follow us on twitter for more advice and style tips.